South Africa lose 3-0 to Uruguay and the world salutes Diego Forlan – pest control officer and eradicator of the vuvuzela. Well, maybe. It’s usually never good when the host nation gets knocked out early, and South Africa look doomed with one point from two games and a must-win match with the minnows of France to come. But this time there is the vuvuzela. Diego Forlan is vuvuzela pest control. 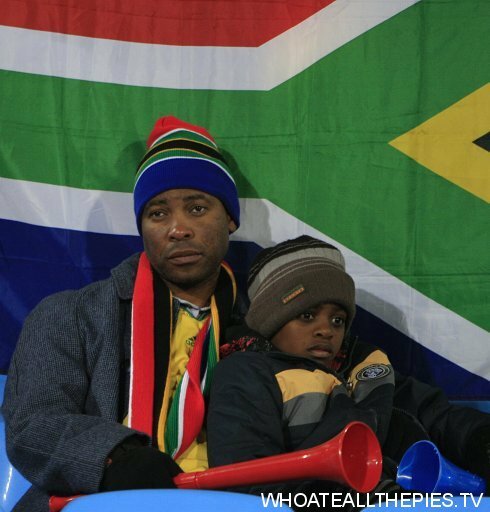 If South Africa crash out will the vuvuzela run out of puff? Call us callous. Call us mean–hearted and cruel. But we begin our round-up of photos from the match with the greatest picture of the tournament so far. I heard hardly any vuvuzela’s yesterday-even when it was 0-0. Either the BBC have a magician for a sound guy (singing/shouting etc was perfectly audible), or the South Africans only use them at games where SA isn’t playing for some reason.